When Heather Givans showed me her new line, Paper Obsessed, I knew I had to make a dress from it. I mean, what else would I do? Heather Givans is one of the most beautiful people I know. She has the biggest heart, she’s such a generous teacher and friend, and is one of few people who would opt for a green juice with me after yoga class early in the morning. I would do anything for Heather, but making this dress was completely my pleasure. I love, love, love how Windham’s quilting cottons feel once they are washed, and they always seem to behave beautifully for my garments. I couldn’t decide which print to choose – could you? Any one of the Paper Obsessed prints would make a perfect dress! So, I asked Heather to choose whatever she wanted, and I’d make it. How adorable are those paper airplanes? From NOTEBOOK PAPER! I love the print she chose (and it just so happened I had a beautiful matching organic solid on hand to coordinate for the lining) so, even though I was still tweaking the design for my Woven Essentials pattern collaboration with our mutual friend Alison Glass, I went ahead and made everyone’s favorite dress – the Bracelet Sleeeved Gathered Dress (we call it the Kelly Dress). Then, overnight it flew for the Windham Lookbook Photo Shoot! What do you think you’d make from Paper Obsessed? Have you already made something from Heather’s fabrics (Paper Obsessed or Succulents)? I’ll make the prize even sweeter by sending the lucky winner from the comments here a copy of the pattern book containing this dress! Please be sure to visit these other lovely people who are sharing amazing projects made from Paper Obsessed for more inspiration and more chances to win fabric. Karen, It’s so cool to be introduced to you via blog and the Paper Obsessed tour. Indeed I’ve made lots of goodies from Heathers first collection; Succulents. A Bathroom mat backed w/Osnaburg, Queen-ish sized quilt (still w/long armer) two pillows, and a medium sized fabric basket. thanks for sharing all your talent w/us. Love the paper airplane dress. Hi Karen! I’d make my 3rd wander skirt!! I would love to make “baby man” shirts for my little grandson out of every piece of this fantastic collection! Your dress is awesome, btw ;).. Thanks for the generous giveaway…fingers crossed! I want to make a dress out of this print! I love this fabric line!! Thanks for the chance to win. I would love to do some embroidery on the notebook paper fabric. I haven’t made anything from Heather’s collections but am obsessed with paper obsessed! It would be so fun to play with these amazing fabrics. I just got more into making clothes but my first adult dress did not turn out so well. I would love to get more instruction. So beautiful dress and cool fabric.I didn´t play with Heather collections and I was sewing clothing before begin quilting.Nice to met you. I think I’d make a quilt, along with some doll clothes! I’ve never made clothes for myself, just for my kids, but I’ve been eyeing your new pattern booklets since they came out. Might be time to take the plunge! 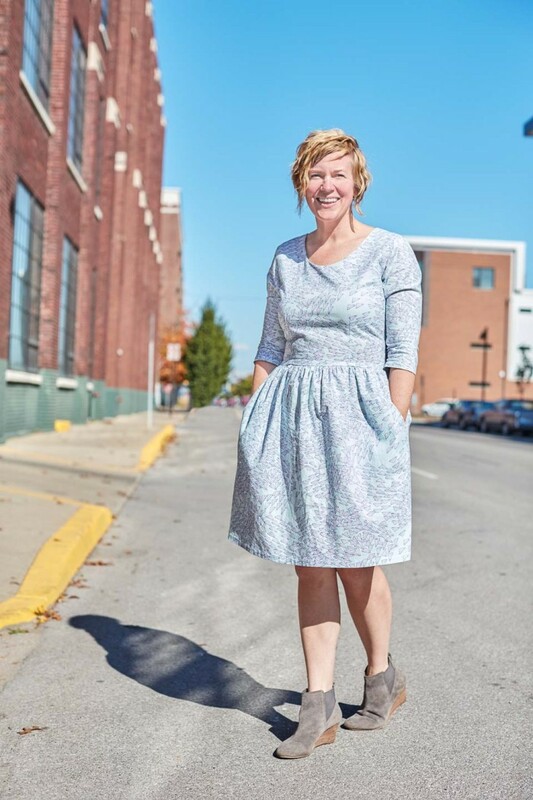 I recently made a dress after years of just quilting. It was so fun to use those skills again. I would love to make me 3 year old a dress with paper obsessed. Oh that dress is totally darling!! The fabric is definitely genius! I’d make a tote for all the teachers I know! I’d love to make some zipper pouches with the notebook print. 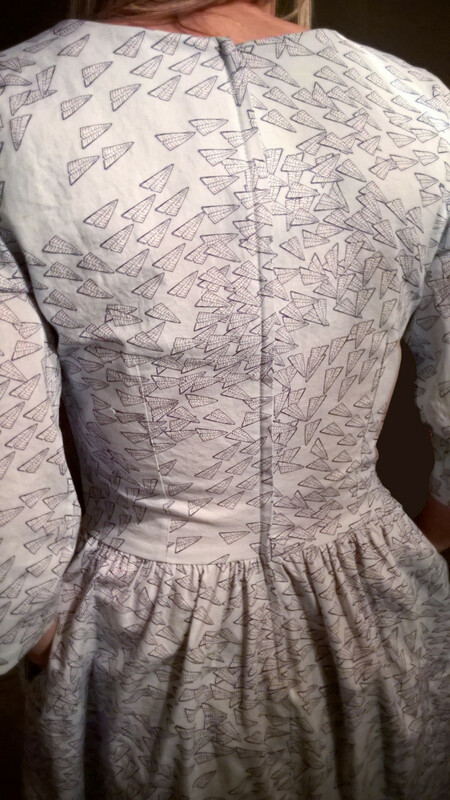 I also love the idea of a paper airplane dress but I’m not sure I could pull that off. I haven’t made any clothes but would like to try. This fabric would be cute for a wall organizer with pockets to sort mail. I’ve made a few great items from succulents – a bed banner, table topper, Christmas ornaments. Looking for inspiration with Paper Obsessed and will definitely make more ornaments! I am only starting to make clothes. I made a costume for my sister, and a few dresses for my little girl. I’d love to learn to make my own clothes. I just bought a small piece of the notebook paper print at my LQS this week and would absolutely love to win some more of it! I would make the Grainline Alder dress. Wow your work is beautiful — love that dress. I have not made anything from Hesther’s fabrics but they are beautiful. The prints would be lovely for garment sewing. I used to sew clothing for both myself and my children and I am working my way back to garment sewing. 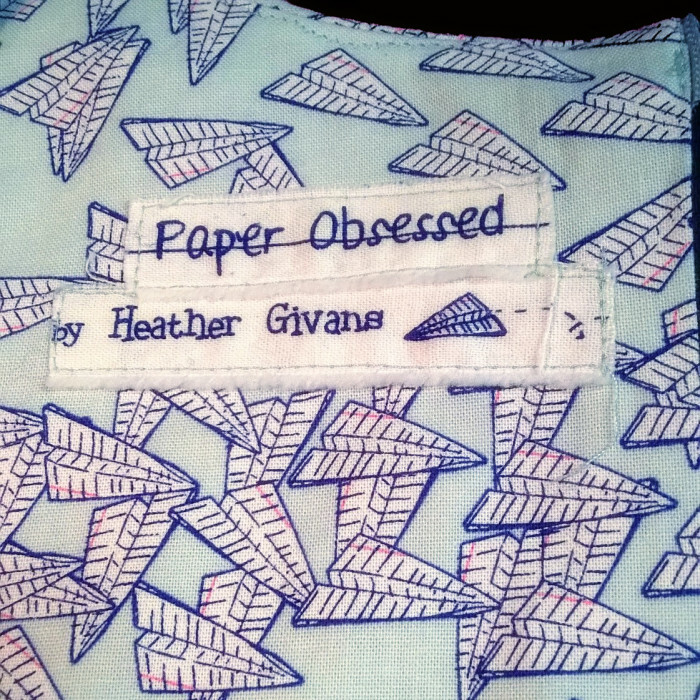 Love the little paper planes – thinking of using for bag and/or skirt. The Glass pattern woven essentials also looks great! I have made a scout tee shirt and that is what I would like to make again from the same fabric you made your dress from. I love this fabric line! Thank you for the chance to win! I love this line. All fun. Sorry I just don’t make clothes anymore, all quilts. Would like to make one with this fabric or Succulents would be great too. I make clothes for my grandkids, but mostly fairy dresses, Little Red Riding Hood capes, etc. I have a collection of Succulents fabric from which I will make pillows for our sun porch. I just might make a kindergartner a backpack from Paper Obsessed. I want to make some cute boy shorts with the paper airplane fabric!!!! HELLO,I have made my daughters and I clothing for years; now I’m starting to do Charity Quilts for Babies and just love doing those! This is a neat collection! Thanks for sharing! I think it would be fun to make a skirt with the dark stamped fabric!! The dress is super cute!! I would like to make a library bag with these. I haven’t made any clothing for over a dozen years. I have made prom dresses and even brides maid dresses. I haven’t sewn any clothing, I am more of a table runner and lap quilt maker. Thank you for showcasing this very cool fabric! My favorite thing to make is clothes, specifically Scout Tees (I have made about 20 now!). I’d love to make a Scout or your Kelly Dress in any of those fabrics, especially the navy security squares pattern (not sure what it’s called). Any of the prints would make great clothes! 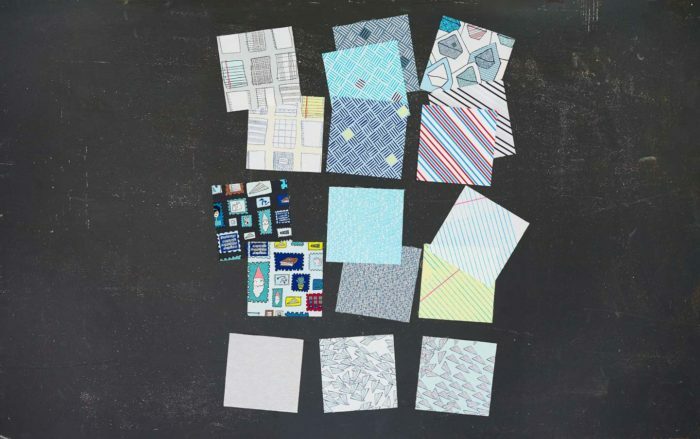 I would love to use Paper Obsessed to make a quilt for one of my nephews. He has toyed with going to school to be an English teacher so it would be fun for him. I do sew clothing, but have gotten away from it. I’m starting to get some patterns and fabrics together to make some clothes for me. The only clothes I’ve made was some pjs…and I was kind of disappointed in them. I think one day I’ll take another stab at it. The more inspiration I see on blogs and IG, the more likely I’ll get over myself and try it again. I think these fabrics would make a cute little shirt for my grandson. I love the Kelly dress! I’m primarily a quilter, but I make clothes for my six-year old granddaughter. I’ve never used Heather’s fabric before, and I love this collection! I think most of it would go into a bag or quilt or pillows, but my granddaughter inspects my stash often and whenever she sees something she likes, she asks me to make her something to wear. So some of it might end up in a dress for her too. Thanks for the fun, and for your inspiring blog! I started out as a garment sewer, but now I mostly quilt. I would love to sew something with the notebook paper, or the airplanes, or any and all of it I love it so much! Thanks for sharing your awesome work. 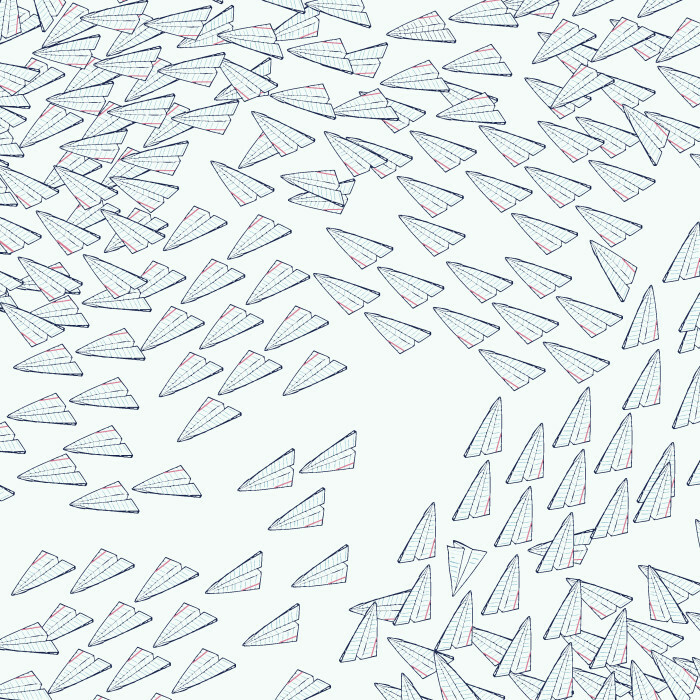 I would love to sew a dress from the paper airplanes fabric. I love to write and send things flying through the sky. This collection is so whimsical and happy! Who couldn’t enjoy more of that? I am a garment sewer with a bit of other types of sewing thrown in for good measure. I am always up for a challenge and sometimes I surprise myself! I did manage to get my hands on a tiny bit of this amazing fabric at Market last Fall. I used this precious goodness on a gift for my sister, Andrea, that is one amazing teacher. I made the 241 Tote by Noodlehead. Andrea just loved it and the cute matching makeup case to put inside. I’d love to win a complete fat quarter set to just go crazy! The pattern would be beautiful “ink” on the stack of paper. I’m obsessed! Cute dress!!! It fits you perfectly too! If I won this gorgeous collection, I’d make a quilt. Thanks for the chance! I’m more into quilting but have made pj shorts for my daughter with success!!! Your dress is adorable! Wow! Love your dress! It is so cute! Makes me want to run out and make one! I’m primarily a quilter so when I look at this fabric I see mini quilts but lately I have been giving lots of purses and bags! This fabric would make cute bags and notebook covers! Your Kelly dress is beautiful! I would try to make a simple quilt with this pretty collection. It’s so great to follow a blog tour! Fun! I can take a look at blogs I didn’t know before and go through past posts! Always a lot to discover. That dress…those paper planes…Amazing!! The fabric would be used in a quilt, some quilt…any quilt. I would love to make a dress one day, but not sure I could pull it off! I LOVE your dress! I would make a quilt–because I would want to look at it all the time. I do make clothes for my kids–simple things like skirts and pants. I keep trying to get brave and make something for me. I haven’t made anything from succulents. I’ve just drooled over it. I love Paper Obsessed! I have plans to make a quilt, and I think the notebook and composition book print would make the cutest backpack! I know that I would make a tote bag and a quilt from this fabric line. It is a fun collection and I especially love the paper airplanes, ruled paper and envelope prints. A tote bag would be a great conversation piece when I use to go to sew ins. I make clothes for many many years and went to college for clothing design. i am currently teaching my sister and niece to sew so back to making clothing we go. I have bought some of this paper airplane fabric and I was planning on making my kiddo a back to school shirt ((bookworm pattern)) with it! This line is seriously awesome though! I would probably make some fabulous accessories like pencil and makeup pouches and a tablet case from Paper Obsessed. I haven’t used any of Heather’s fabrics yet. And yes, absolutely!, I sew clothing, both for my daughter and myself. I would definitely make a quilt and matching pillows! I’m pretty new to everything fabric and still learning so much and making clothing is something I’ve been wanting to learn. I don’t have any of Heathers fabric but I would love some! I love the dress you designed, so cute! Thanks for a chance! I don’t make clothing because I’m pretty intimidated by it, but I would love to try something simple. Do I make clothing? Absolutely, I’m going to throw a dress together this week for an event on Friday. My mom was a seamstress so I have been sewing all my life. I would rather make a quilt then sew clothes and I only sew clothes for myself. I would make a tank top with the envelope print fabric. I’ve made a few tops. I’d like to make some more, but it seems like I always have to make some modifications to patterns, so I always get discouraged. I would like to get better at sewing with patterns. I do still try to make clothes when I get the time. I would love a shift dress made with those paper airplanes! Thanks for sharing with us. I have not made any clothing other than skirts for my daughter. This dress is so inspiring though, makes me want to learn! I love the paper obsessed line and plan to make a few things with it and have her mini pattern started. The whole line is wonderful and the airplane fabric made a beautiful dress. Love this fabric. I would use it to make a book tote for my 15 year old daughter. I have been sewing for about forty years, both clothing and quilts and some home dec stuff. Just found your site via this blog hop so I need to go take a look around! Amazing dress! I love this line– the colors are lovely and I could see many fun teacher gifts from this line! I would also love to use some in a scrap quilt I’m making for my little guy (those paper airplanes are so fun!). I already have plans for a dress! I love the colorful postage stamp fabric, and I think it would make the perfect dress! I would make a quilt. I am just getting into sewing clothing and I love it, but I think this fabric screams quilt to me. I love the notebook paper fabrics. They are awesome. Love these! I would make a lot of bags, any size, just for summer days at the beach! I do not make clothes, strictly a quilter. I haven’t used her fabric as yet, but when I win I will make a table runner for the living room, the table my husband calls the mail table. Thanks, and I love your dresses!! I do make clothes. And I want that dress!!! I have not made clothing since my kids were little, and they are at varsity now, so that is a fair indication of how out of touch my skills are. Thats what I like about quilting, so simple, straight lines, no buttonholes or zipper insertion. Maybe I need a night class to get my ready in case of grandkids! Thanks for the giveaway, the dress is gorgeous too. I’m planning a quilt for a new baby. Hi, I love your dress. I just received a package of fat quarters of Mail Obsessed, and now I’m obsessed with using them for a shirt–how cute would a sleeveless top with patches be? Thank you for the inspiration! With this collection of Paper Obsessed fabrics, I’d make a selection of baby boy pieces. A quilt, a play mat, a diaper tote, bibs, rompers…they’d all be so sweet! I do make clothing and love to quilt too! I love to make clothes! I would like to make a skirt w/ this fabric and I love the succulent line too and made some cute fabric baskets w/ that line! yes, I make clothing, childrens are my favorite. Lately trying to make garments for me is pretty frustrating because the pattern never fits, arg… but I have many young grandchildren to sew for, which is fun. I would love to make a dress for my daughter. I would make a bag to carry my laptop in and another one for my iPad. Fabric is ironic for these bags as we now use very little paper to write on anymore. Plus, I can remember making the paper airplanes and seeing whose would fly the farthest. I want to make this dress! I haven’t made anything with Succulents or Paper Obsessed yet, but I’m dying to do so! I’m relatively new to sewing clothes, but so far it’s going well! A quilt…what else? :-) What a cute line! A book bag seems appropriate to me, and I need a new one. Since I’m obsessed with bags, I’d probably make a tote. I use to make a lot of my clothing, but now I am into quilting and don’t have time for making clothes. I have not made anything with Paper Obsessed, but would like to. I think some bags would be in order. I LOVE this fabric!! I want to make the letters home quilt – combining my love for fabric and handwriting!! Love your dress! I would make a quilt to read under. Love this fabric line! I love this fabric! I’d make a messenger bag for my son and he would be thrilled. Love this fabric!! (Your dress is sooo cool!) I would make a great Tote for my Daughter, she is in Graphic Design…she will LOVE this Line!! Bet I could make her a few great tops too! Beautiful dress. I don’t make clothing but I’m obsessed with making bags. I’d love to make an Aeroplane Bag with the paper planes fabric. I actually did make an amazing pillow from Heather’s Succulents collection. It was a gorgeous line. powersjlc at gmail dot com. Thanks for the chance. I used to make most of my clothes and have gotten away from it. Lately I have wanted to get back to it and I am looking for a skirt pattern to start off with. Oh, such beautiful fabrics! I think i would love to make some pillows and perhaps my first tunique? Beautiful dress, i love it! I made some clothings years ago, dresses and skirts mainly, but I’m very much confortable at making quilts! I love your dress! I would make a quilt for my son who works at Boeing in Seattle. I have never made anything from Heather’s fabrics but I love both lines! I sew clothes for my self (occasionally) and my daughter (more often). I’d love to make a back to school dress but since my daughter is not even 2 that isn’t really needed in this house. I might make a library bag for my middle son, or a quilt. Because when all else fails, I make a quilt. I make a lot of quilts. I am starting to make my own clothes and the dress is lovely!! I would probably use it for a pencil pouch or notebook cover. I do make clothes and a dress from this line would be amazing! I also see lots of tote bags and zipper pouches. I’m planning a wall quilt in the Letters From Home pattern — I can hardly wait to get started. But I love to sew clothing, and might just put a dress at the top of my to-do list! What do you think you’d make from Paper Obsessed? — oh I would love to make a tunic — and that is a stretch I tell you! Thinking sleeveless so I don’t have to worry about inserting sleeves! Have you already made something from Heather’s fabrics (Paper Obsessed or Succulents)?NO! Never! I would love to! Do you make clothing? many many moons ago when I was in highschool [don’t ask how many years!] I would love to tackle a top/tunic though! Love you fabric choice with the airplanes! Love it! Wonderful use of the fabric. I long to quilt with it…if I win. I have really only made clothes for my son. It was alot of fun, but was more than twenty years ago. I bought material and a pattern to make a dress for myself, but it’s hanging in the bag in the closet. Now I’ve mastered zippers so might be I try to make the dress this fall. Your pattern is great and I would try that too with these lovely fabrics. Thanks for the chance! I’ve never used Heather’s fabrics but I’m so excited to change that! I would probably make a quilt. I used to make a lot of my own clothes, but not so much lately. Thanks. Previous Post: Story Collection – What’s your Story? Next Post: We have a Paper Obsessed winner!